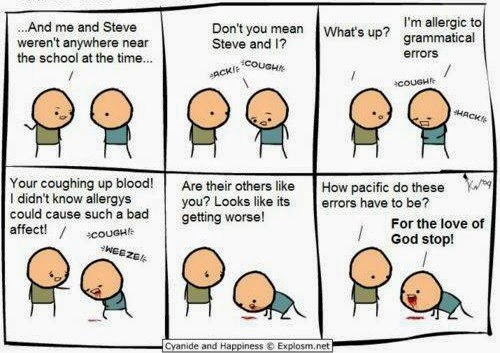 I’ve been correcting assignments for the students I tutor and people … the grammar is atrocious. I mean its bad. It’s hand-over-eyes-peeking-through-fingers bad. It’s like that bad accident you cant look away from bad. I hate to judge, I really do, except …. 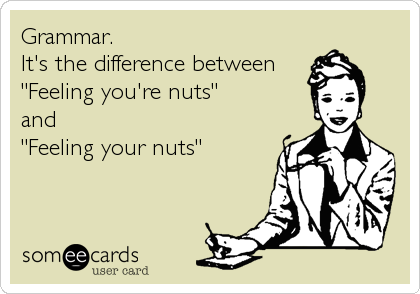 I can’t understand how my students, college/university students, cant grasp “there, their and they’re” … “your, you’re” … “to, too”. I can deal with spelling complications like “favourite vs favorite” or “colour vs color”, because the spellings are different depending on the country (Fun fact: I use the British spelling of words and so I see red squiggly lines all over my posts), but “their vs there” … NO. I can ignore these mistakes on the interwebs but I’m being forced to read them over and over and over again … they’re lucky I like them. I should have marked these papers on the weekend and created a drinking game: take a shot every time I see a wrongly spelt word, a grammar mistake or a just plain jacked up sentence. Unfortunately for me, if I were to do that now, while at the office, I’d be a happy camper all day at work today fired! So I’m going to sip on my coffee (hashtag addicted) and mark these papers … on my desk that’s piled high with legal files … and try not to scream. Before I go, Ill leave you with the word of the day … and an ehem ‘apposite’ story to end this post. I’ve said before that I am in grad school. Anyway … so I’m sitting in class the other day and the lecturer says a word in a sentence that caused a fellow classmate to boldly and embarrassingly announce to the class that the word that the lecturer used was in fact not a real word and a more appropriate word would be ‘appropriate’. I knew the word. It was a word. It is a word. What’s the word?? ?